This 250sqm family home nearing completion on site becomes the sixth contemporary one-off house designed by the practice in its home town. LHS secured a planning permission for the self-build client on this tricky site just outside the town’s development boundary, adjacent to the Toll’s Meadow nature reserve. The land had been used as a builder’s yard for decades, and the opportunity to prevent intensification of this potentially unsightly use was a key part of the planning committee’s decision to approve the plans. Three quarters of the site area will be naturalistically landscaped as a visual extension of Toll’s Meadow. Breaking the substantial house up into three smaller volumes cleverly reduces its apparent scale. 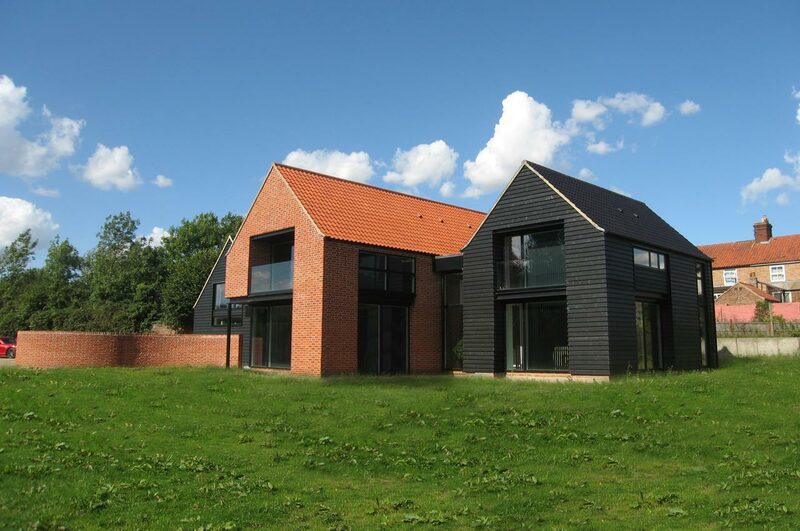 The pitched roofs and brick facing of the contemporary-styled home provides a new tidy backdrop to the green-space against the skyline of the town’s Conservation Area beyond.